This species is accepted, and its native range is SE. Kenya to NE. Tanzania. 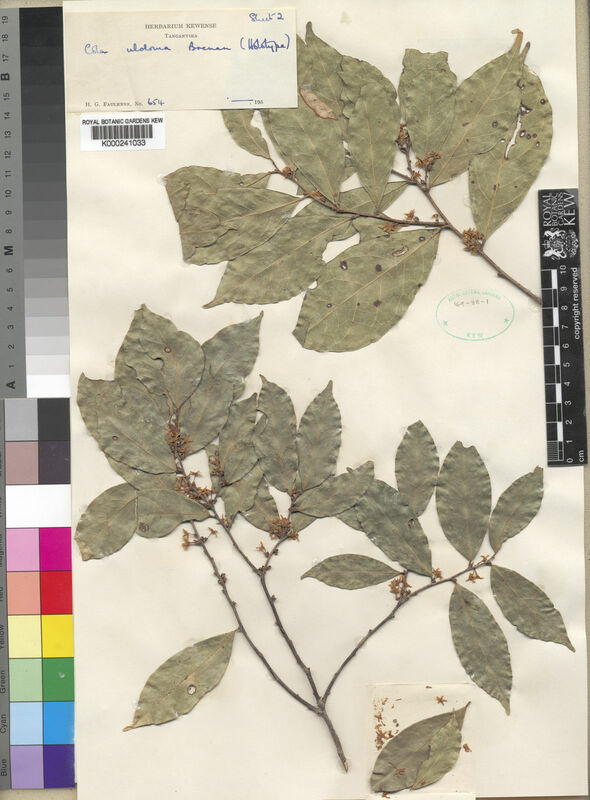 Of the 13 specimens seen, only five fertile gatherings, listed above, have been seen for Cola uloloma: this species seems rare, poorly known and restricted to a few small coastal forest fragments, mostly the Kaya forests of Kenya. Its extent of occurrence is estimated as less than 20,000 km2. Given that forest quality is declining in several of these patches, and that less than 10 locations are known, Cola uloloma is here assessed as VU B2a,b(iii), i.e vulnerable to extinction. The uniformly short petiole (less than 7 mm) seen in Cola uloloma and C. chlorantha (q.v. for diagnostic characteristics) is unique in East African members of the genus and make these two species easily recognized in the sterile state, assuming that they are recognized as Cola in the first place. Most other species of Cola have a mixture of very long-stalked (to 19 cm) and very short-stalked leaves. Hawthorne 1645 from the Pugu Hills ( T 6), though sterile, probably represents this species, but without flowers or altitudinal data it is difficult to be certain. Luke (pers. comm.) reported sight records in Kenya for the lower (Kaya Muhaka) and upper (Mangea Hill) altitudinal ranges cited above. Luke (pers. comm.) also reported seeing what was possibly this species, but might also be C. chlorantha (especially the more southern and higher altitudinal specimens) in T 6 (Kimboza, Luke 8814 EA n.v.) and also in T7 ( Luke 8747 EA n.v., 900m alt. and Luke 11311 EA n.v., 1330m alt.). Cheek, M. & Dorr, L. (2007). Flora of Tropical East Africa, Sterculiaceae: 1-134.